It was New Year’s Eve, Me & Ushma (Co-founder) were busy planning a house party. With foods, drinks, lights and music in place, we were sure it would turn out to be a night to remember; which it almost was. Except that, somewhere between setting-up the food, tuning the playlist, mixing drinks, and ensuring everyone was having a great time, we realized how exhausting this all was; and we hadn’t even begun to consider the aftermess that was to follow! ‘If only we had a little help’— was our first thought. But who would’ve fit into our budget and volunteered at the 11th hour? It was this concern that led to the idea of TaskMitra. Wouldn’t it be convenient if there was a place online where you could just say what you need, when you need it and at what price! Surely there would be someone (professionals, amateurs or even part-timers) around you wanting to earn some extra money by lending their services. When we started up, we spoke to consumers, did an offline beta test where we literally did everything offline in the same way, as we planned to do it online. Telling consumers how easy we plan to make outsourcing, Really helped us. We did couple of Social media hacks (jugaads) to get the word out. We currently have ad spend budget. So, its all word of mouth & SEO,SMO. There are a lots of problems associated with the traditional way of outsourcing work. The first thing that comes to one’s mind is —where can I find help, and who’s actually going to help me out? 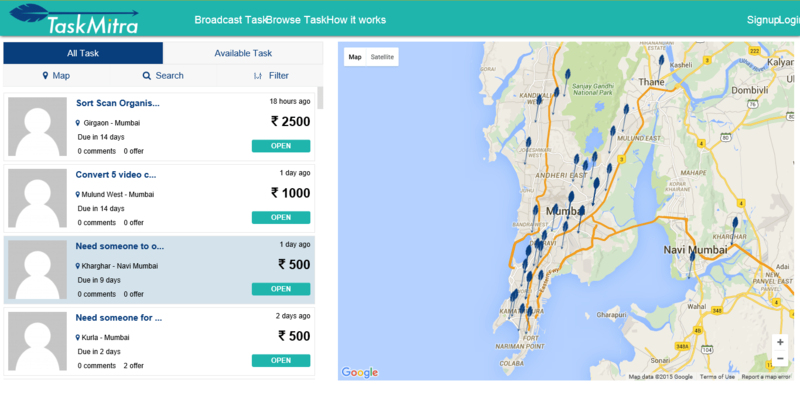 TaskMitra eliminates these conventional ways of asking, hunting, flipping pages, or even begging for help. Today as technology is enabling trust and friendship among strangers, TaskMitra is trying to reinstate a buddy system where people can freely connect and seek help from each other. To broadcast a task, you simply need to describe what you need, along with the location and budget. Once the task goes Live, Mitras with the required skills or intentions make an offer on the task; after which you can choose a suitable Mitra to complete the Task and securely Pay online. What exactly makes TaskMitra stand out in this new emerging business of on-demand-service marketplace is its emphasis on community integration by getting Broadcasters and Mitras on a single organized platform to collaborate seamlessly for every kind of tasks. Unlike most other players in this genre it is not merely limited to a service that would require a professional handyman or trainer. Although most Mitras are professionals, you can also find freelancers, part timers, homemakers, students (adults), experienced retirees and people between jobs who are onboard. That means no matter what you need, you could look for any kind of help (even the quirkiest tasks) and with a few clicks you can receive offers from Mitras, like a boss! In contrast to most companies driven by a desire to up their competition and protect their stakes, TaskMitra is an all inclusive platform that allows everyone with certain skills, talent and experience to provide services and help users. Creating a plethora of opportunities, it’s interesting to see freelancers connect with clients, students make a few extra bucks –while they’re still learning, working professionals take up a weekend vocation and even seniors with some free time on hand earn while they choose to do what they like. The platform not being limited to a few services, leaves the scope unimaginable as, quite truly, there have already been tasks that seem out of the ordinary. From needing someone to teach a mid-thirties woman to ride a bicycle, wanting a home gardening enthusiast to help set up a small home farm, to looking for a person with good handwriting to make personal invites, people are getting a hang of it, and beginning to experiment with it. With a large chunk of growing transactions & users, Our Team is data focused & has implemented a strong footing in Big Data & machine learning. Data, which is captured is formatted, stored, and analyzed. This helps to gain useful insight to increase revenues, get or retain customers, and improve operations efficiency. Concentrating solely on Mumbai for now, it aims to expand to Pune, Bengaluru ,Hyderabad & Chennai by the end of this year. However the next step is to also launch a mobile app that will help us take social collaboration to the next level with Multilingual Interface & other innovative features across PAN India! Getting people to believe in your product & use it! Is the greatest challenge we’ve faced for the first 1000 users. It was very difficult to make people aware that a Task Marketplace is completely different from listing portals. Changes to UI/UX greatly improved the user behavior. Iterating the product, with a data driven approach helped us. Some service providers are very lazy and highly unorganized, It was a task to get people aware about what it means by delivering the best services on time in a punctual manner always. Do you have any recommendation for other Organizations to improve customer focus? Do not be shy is asking your customer how do they like your services/ product during everyday customer interactions. If you don’t have a reason for face-to-face interaction with a customer, look for ways to stay in touch and show you are listening and eager to keep the lines of communication open. ie Social media etc. How you and your staff communicate with your customers is just as important as what you communicate. Remember that your customer wants to see the sunny side of you and your business, so have your filter on and put yourself in their shoes. It’s a old saying ‘ Customer is King & he is always right’ – That is what we believe in & work for achieving excellence comes ‘first’. The customer should always be the focus as they are the backbone of an organization. An organization should surely build their trust. Interacting with customers through social media could be one way of doing the same. Bringing face-to-face interactions, special services, and knowledge together could help you to create a unique community for your customers. Your overall direction on Customer Focus.. Remember to carry through on your customer service goals wherever your business has a presence. This means both online and offline. More than ever, social media is a systemic part of your customer service model, so if you have a presence on sites like Facebook, Twitter and so on, be sure you are actively listening, engaging, monitoring and responding to your customers online. Carry Customer Service Across All Your Customer Touch Points.